This past Friday, I attended the fabulous Return Emigrations conference at Columbia University. Featuring a distinguished group of German and American architecture historians, the morning and afternoon sessions provided a much-needed assessment of architectural modernism's travails in the United States and in Germany. The conference website alludes to a familiar narrative: we customarily think of modernism as a West- and Central European import. From MoMA's 1932 Modern Architecture show, to the influence of Bauhaus mandarins like Walter Gropius, Mies van der Rohe, and Josef Albers in American universities, modernism was a one-way current. There is plenty of scholarship and historiographic materials that contradict this claim (Gwendolyn Wright's brand-new USA is, for example, that looks at the development of architectural modernism in America in its own terms). 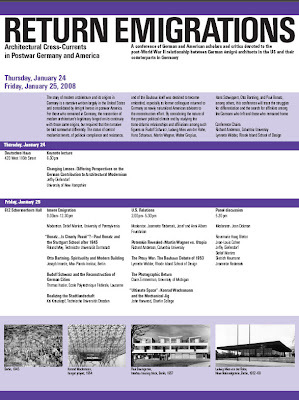 The conference, however, focused on a specific theme: the relations between "German emigre architects in the US and their German counterparts." The sessions outlined two basic themes. The morning session, featuring papers about Paul Bonatz and Rudolf Schwarz, considered a different narrative about modernism. The works of Bonatz and Schwarz thus showed modernism's inherent eclecticism, a rubric that included everything from Heimat wood construction to eschatological theories about the earth and built forms. The afternoon session considered, in the words of attendee Juliet Koss, the "after life of modernism." These papers focused on the return of people like Gropius, Martin Wagner, Mies, and Konrad Wachsmann to Germany in the 1950s and 60s. Whereas Richard Anderson's paper considered Martin Wagner's fall from grace as a symptom of his turn to "urban management", Lynette Widder's and Claire Zimmerman's papers focused on the reception given to Gropius and Mies upon their brief return to Germany. Widder's paper analyzed how Gropius was immediately embroiled in a dispute regarding the historical and ideological significance of the Bauhaus. Zimmerman's paper, on the other hand, considered the rehabilitation of Mies' career after World War II in the context of a flurry of published photographs of his buildings. Konrad Wachsmann's maniacal writings and designs became the focus of Jeffrey Harwood's presentation. Here, Wachsmann was presented as a design thinker who, in trying his hardest to find an architectural solution to his own ideas, pushed the limits of some as-yet-undetermined epistemological boundary. An enlightening panel discussion at the end of the sessions pointed out that understanding the development of modernism in terms of pre- and postwar is unhelpful and counter-productive. As Jean-Louis Cohen, Joan Ockman, Rosemarie Haag Bletter and others indicated, the war was a "porous" event. The years 1939-1945 created a new and varied network of channels and communications that paint architectural modernism in a newly profound, complex (and welcome) light.